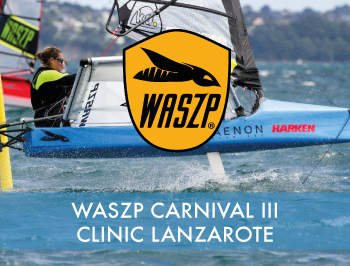 Waszp – Foiling Carnival III Clinic | Dinghycoach 25 Feb: Arrival day 26 Feb: Clinic day 1 27 Feb: Clinic day 2 28 Feb: Clinic day 3 1 Mar: Clinic day 4 2 Mar: Departure 5-day Clinic Option 25 Feb: Arrival day 26 Feb: Clinic day 1 27 Feb: Clinic day 2 28 Feb: Clinic day 3 1 Mar: Clinic day 4 2 Mar: Clinic day 5 3 Mar: Departure Daily schedule 10.00h Briefing / Safety Briefing / Foiling Theory 11.00h-13.00h Sailing session 13.00h-14.00h Lunch 14.00h-16.00h Sailing Session 16.30h Short Debriefing Pricing Option 1: 4 Day Clinic Excl. Accommodation € 1250,- excl. 7% VAT Option 2: 4 Day Clinic Incl. Accommodation € 1399,- excl. 7% VAT Option 3: 5 Day Clinic Excl. Accommodation € 1350,- excl. 7% VAT Option 4: 5 Day Clinic Incl. Accommodation € 1599,- excl. 7% VAT Accommodation Sailors get a choice to book the clinic including accommodation to stay at our hotel or excluding accommodation and arrange their accommodation in a villa through us or elsewhere by yourself. Lanzarote offers a great variety of conditions and there are very few places in the world where sailing hours can be made as effective as in our winter base in Lanzarote. During our 4-day & 5-day intensive training camps we will get quality hours on the water and teach you the basics of foiling! Due to the intensity of the boat, sailors may be asked to share a Waszp and rotate in shifts with another sailor so they can consult the coach in the rib while not sailing. Sailors will be asked about their level before getting confirmation of their clinic entry, you need to have an intermediate skill level before being able to join our foiling clinic. Sailors get a choice to book the clinic including accommodation to stay at our hotel or excluding accommodation and arrange their accommodation in a villa through us or elsewhere by yourself. In case you would like to book a villa through us, please contact Diego at lanzarote@dinghycoach.com! Airport transfers are only provided for sailors that are traveling alone or groups that have made special arrangements by e-mail with Bocha, Pim or Diego. Whats included in the clinic fee?